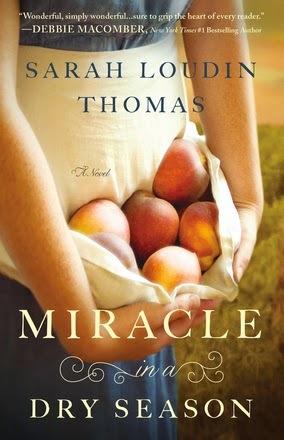 Miracle in a Dry Season by Sarah Loudin Thomas takes place in 1954 during the time of a drought in Wise, West Virginia. Perla Long is hiding something from her past after she arrives in town, and Casewell Phillips senses that something is wrong. Perla's gift causes the town to split as some offer her support, while others condemn her. This was a wonderful, fast-paced read beginning in 1954 when Casewell, a 35-year-old bachelor and a carpenter by trade, meets Perla, an unwed mother with a little girl, Sadie. Casewell becomes enchanted with Sadie and thinks Perla is the most beautiful woman he has ever met. His parents also become very fond of Sadie, and John especially enjoys his time with her. John learns he has a terminal illness, and his time with Sadie becomes very special to him. The town frowns on Perla being an unwed mother and makes it difficult for Perla, but Casewell keeps her friendship. Shortly after Perla's arrival the area suffers from a drought that destroys crops, dries up wells and hurts the animals. Perla, a talented cook, is able to take small supplies of available food items and create enough soups and stews to feed the town. Her faith keeps her cooking and the town eating, but the town folk questions her ability to do this. The local preacher decides she is exhibiting witchcraft and goes on a a campaign to stop her. Casewell steps in to try to remedy the situation and win the town. There is much judging of each other throughout the book. It caused me to do some soul-searching about judging others and showed how easily we all "jump to conclusions" instead of having facts first. I highly recommend this book to anyone wanting a sweet love story and a lesson in tolerance of each other.